I was tagged by naturalpoppy on You Tube the other day to do a Why I love NaNoWriMo tag. So since I don’t do You Tube videos, I decided to do it here for her and you instead. The main reason I love NaoWriMo is because it got me to sit down and write. I’ve been saying forever and ever. I want to write a book and other people have told me you should write a book. Now I’m actually doing it. It may not be great stuff but I’m getting the words down everyday and more than the minimum daily count. This is my first participation in NaNoWriMo and I started scared out of my mind. I just couldn’t perceive myself writing a minimum of 1,667 words a day. I thought it would take me all day to get it done. In fact day one went really well I wrote 1,753 words in two hours. God only knows where it all came from. I continued the rest of the days hoping they would be the same. Honestly, some of the days have been remarkable 3,000/4,000 words. It’s really been unbelievable and an enjoyment! He sunk into the sofa and attempted to envisage his lonely future. I’m fond of Zachary at the moment. He’s hard-working, good-looking and a good dad sort of. He’s a lousy husband and has a bit on the side. How many words have I written so far? When and where have I been doing most of my writing? Every morning, I write near a well-lit window in my living room in an extremely comfortable chair. My legs are propped up on a pillow on another chair and my Macbook on my lap. If I start by 9am, I’m usually finished by noon and sometimes even before, unless I feel like writing more. Have I had to sacrifice anything in the past week in order to devote myself to writing? No not really. I can’t move around a lot because of my torn Achilles tendon which is healing slowly, but surely. In essence, I’ve got plenty of time to write at the moment. Today is Day 9 of NaNoWriMo and I haven’t yet started to write, but ideas are brewing up top. I’ll be doing some night writing to see if that agrees with me. I decided to share a little snippet of my story. What do you think comes after It was 3am…? She woke suddenly in the middle of the night. She looked over at her husband rolled up in a deep narcotic sleep. She felt her side of the bed as she got up. There was a large damp circle of wetness that had seeped into her nightgown. She went to the toilet to urinate and reflected on what to do next. As she pulled down her underwear she noticed the little beads of water running continuously but slowly down her leg. It was if the faucet had a drip that wouldn’t stop. It was 3am….. Since I’m a NaNoWriMo virgin, I’ve done a bit of all the above. Now that we’re less than a day and a half away from NaNo Day I’ve decided to really throw my back into it. 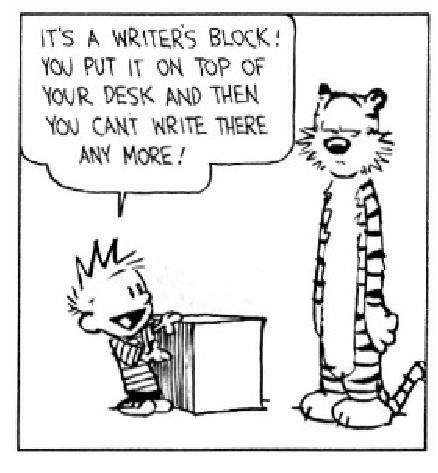 The only thing that’s going to stop me from writing is a block falling on my desk. Ok, ok, I know that’s not likely to really happen but you get what I mean. I’ve surfed the net like crazy gathering useful information and advice from NaNoWriMo regulars. I’ve understood that this is essentially a writing exercise. I repeat this is a writing exercise. Henceforth, go forth and write, write, and write…. During my search for great advice, I watched some You Tube videos and read a few blogs. Below I’ve compiled the useful tips and tricks I’ve found to help those striving to reach the 50,000 word goal for the 30th of November. 1. Beat your inner editor into submission! Don’t critique or edit! All first drafts are crappy anyway! You can edit and proofread from December on. 2. Checkout the Special Offer rubric on the NaNoWriMo site. There you’ll find free offers of writing programs that you can use the month of November on a free trial basis —- like Scrivener, Storyist, Yarny, and WriteWay. There are also offers from companies like Createspace and Outskirtspress which can help interested participants with independent publishing. None of these offers are obligatory but they can apparently be helpful in the writing process. 3. Check out the NaNoWriMo twitter sprints. The twitter sprints can urge you to continue to write and faster at those grave moments of the blank page. 4. Find nice places to write and if possible, change spots to give you different perspectives. Carry a notebook with you at all times for when you get ideas in weird places, like in the middle of a work meeting, in the toilet, on the train or subway, buying tea or coffee at Starbuck’s, etc. 5. Track your progress on the NaNoWriMo site. This will incite you to keep up to a correct pace. You can also track everybody else’s progress and that should whip you into shape. 6. Tell everybody you know that you’re going to do NaNoWriMo. What better way to be boosted into finishing the challenge of 50,000 words. After telling so many people you won’t dare quit. 7. Go to local write-ins. It’s good to have face-to-face buddies, as well as virtual ones. 8. Plan and make the time to write at least 1,667 words everyday. 9. Prepare a story outline and know your characters. You then won’t waste so much time on things like names and places. 10. Consume like crazy the NaNoWriMo pep talks which will arrive in your mailbox everyday. Encouraging words from published writers who know what you’re going through can be nothing more than an aid. 11. Get a play list of music ready to play while writing to get you into the mood of your book. This will help with constructing the setting and ambiance of your novel. 12. Stock up on a few snacks and try to make at least half of them healthy. You don’t want to overdo the sugar and fall asleep while writing or worse drink so much coffee that you get the jitters. 13. Last but not least, have FUN!!! You should enjoy yourself. You shouldn’t be taking on this challenge if you don’t like writing. I wish all the NaNoWriMo participants lots of luck and enjoyment. If anyone has any other tips for me, drop me a line or two in the comments below. Why don’t you join me and write your story?